NOTE: The horn chirp can be disable by pressing the lock and unlock buttons simultaneously until the hazard lights flash, and no enable press the lock and unlock until the horn chirp. 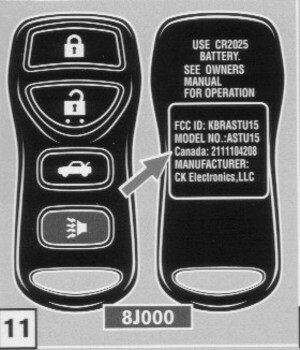 To reprogram (enter new ID) key fob (keyless remote controller) follow the steps. NOTE: Key should be withdrawn from ignition key cylinder completely each time. NOTE: Do not rush the insertion/removal key cycling process. The side marker/tail/license lamps and interior illumination will flash twice when this step is accurately completed. 3. Insert key on ignition key cylinder and turn ignition key switch to "AAC" position At this time, the new ID code is entered and original (previous) ID codes are erase. NOTE: Do not press the button more than one time in the above step. If the button is pressed more than one time, the programming procedure will not be successful. The side marker/tail/license lamps and interior illumination will flash twice when this step is accurately completed and programming is successful. If there is only one remote controller skip step 5. NOTE: If you need to activate more than two additional new remote controllers, repeat the procedure on step 5 Additional ID code entry for each new remote controller. NOTE: Entry of maximum four ID codes is allowed and any attempt to enter more will be ignore. 2. From the door switch unlock the trunk. 3. Insert and remove the key from the ignition key cylinder more than six times within 10 seconds. NOTE:; At this time, the new ID code is entered and original (previous) ID codes are erase. 5. Push any button on the new remote controller once. If there is only one remote controller skip step 6. NOTE: If you need to activate more than two additional new remote controllers, repeat the procedure on step 6 "Additional ID code entry" for each new remote controller.